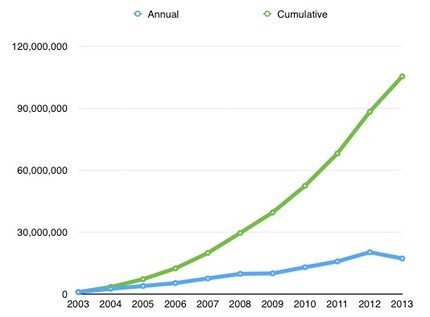 The blue line is the yearly shipment numbers for interchangeable lens cameras, and the green line is the cumulative base of such cameras in the marketplace. While CIPA doesn’t have breakouts of DSLRs from 1999 through 2002, we can make a reasonable guess at the numbers from early statements by Canon and Nikon. Grand total: there are about 106 million digital interchangeable lens cameras that have been made and shipped by the Japanese companies in 14 years. Thing is, in almost all that time, Nikon’s market share of interchangeable lens cameras has never really strayed below 30%, and Canon’s has tended to be closer to 40%. Let’s be liberal today and assign the two a total of 66% market share. That means that there are close to 70 million Canon and Nikon DSLRs in the gear closets and bags around the world. I don’t think Canon and Nikon have sold one million mirrorless between them, but again, I’m being liberal today, so we’ll reduce that DSLR number to 69 million. But wait, you want to know about the mirrorless cameras. Well, Olympus says they’ll sell 630k this year. Best case, Olympus has sold less than 2m m4/3 units to date (coming up on four years). Indeed, the camera line that would come closest to the Big Three list I just presented is Sony again, with the NEX E-mount sales. So think about this: you’re an independent lens maker (e.g. Sigma, Tamron, Tokina) looking for volume. Which mounts do you develop for? EOS and F mount for sure, maybe Alpha. Now if you’re a low volume lens maker to start with (e.g. Voigtlander, Schneider, Zeiss, etc. ), the lower volume mounts aren’t necessarily a problem for you as long as you put out optics that will resonate with a large enough percentage of users. It’s the old small fish in big pond versus big fish in small pond problem. Now I’d also argue that Canon and Nikon have been lazy. Nikon executives look at the stats and see that they’re selling 30% of all lenses and 30% of all interchangeable lens cameras, so everything looks hunky dory when viewed that way. It certainly has put a big price tag on the wannabe competitor’s efforts, as they have to produce new lens lines that are reasonably complete in order to say that their mount is remotely “equal” to the existing legacy mounts in terms of choice. To their credit, most of them have done just that: we already have reasonably complete basic sets in m4/3, Fujifilm X, and Sony E-mount, something I can’t say about Canon EF-S and Nikon DX, which is why I say they have been lazy. The problem is that the cameras of the mirrorless clan are getting much more competitive with DSLRs and the lens lineups look better to a serious shooter, at least at the crop sensor level. Of course, the usual rejoinder is “you can use full frame lenses on crop sensor cameras.” Sure. And from 75mm equivalent on up that gives us a ton of options for Canon and Nikon crop DSLRs. Below that? Kit lens, variable aperture wide angle zoom, maybe one fast prime. Oh, and did I point out that the Olympus lens was a constant f/2.8 and the Nikon was f/3.5-5.6? So here’s another thing that arises: the m4/3 sensor is about a stop behind the DX sensor of the Nikon, but by the point you get to 18mm on the Nikkor you’ve already given back that stop at the lens, and beyond that focal length the Olympus actually moves ahead in low light ability. Doh! Okay, I’ll be the first one to admit that we have other factors that come into play: the D7100 is 24mp, for example, and it has a well proven focus system and no image lag in the viewfinder. Of course, the Olympus is dust and splash proof, and has a tilting LCD. See what’s happening here? Nikon has allowed an upstart competitor to get into a Marketing Check Box war with them and Nikon’s not necessarily winning with every user, especially when the user extends their look to the lens set. Indeed, the reason why I shoot with both Nikon DSLRs and Olympus m4/3 is that, when I’m carrying a camera for long distances in wild country, the size/weight advantage of the Olympus becomes significant, and the image quality penalty is negligible for my work. When I’m doing wildlife shooting, the D7100 has the advantage of all that incredible FX telephoto line. For my front-country landscape work, nothing beats the D800. Every time you don’t do something—offer a full lens set, for example—all you do is enable competitors. On the other hand, the score is 32 million to <2m right now, so Nikon has tended to already have made the sale and locked a customer into their legacy mount. And that’s exactly where we are right now. To buy into anything other than a Canon or Nikon DSLR, you’re fighting against the legacy problem. While I noted that the basic lens sets of all those other mounts are now pretty reasonable, notice the word “basic” in that sentence. You can simply find more options in the EOS and F mounts, including an incredible bulk of used lenses. Second, if you already started in those mounts, the penalty for leaving is that you start over with your lens set, a potentially big financial undertaking, depending upon how many lenses you’ve accumulated. For some of us, it’s worse: I can’t duplicate my existing lens set except in one mount: move to Canon. My PC-E, macro, and telephoto lenses basically dictate that. That said, if I’m on an 18-mile round trip backcountry hike to a remote slot canyon in Utah, my Nikon gear ain’t coming with me these days. It’s too big and heavy compared to my other options, mostly because Nikon insists that we use FX lenses on DX cameras. Pity. But there’s an upside for me: I’m also carrying a lighter tripod, my non-Nikon camera is more weather-resistant, I get more precise focusing more easily, and when I’m doing long shutter speed night shooting with light painting I can actually see the cumulating exposure as I create it. The legacy of the EOS and F mounts is this: they created a duopoly and filled those mounts with lots of lens options. If you bought into that at any point, you now have EOS or F mount lenses and are more likely to buy the same thing down the line. The fact that this describes at least two-thirds of the current interchangeable lens camera owners means that this will continue for some time. But here’s the thing: how many of those EOS and F mount owners have been “sampling” the other options like I have? Every day I seem to find another one. So the duopoly is starting to weaken. That should send a clear danger signal to Canon and Nikon, yet the only response we’ve seen so far is that Canon has been making some smaller and lighter entry-level DSLRs and Nikon finally got around to making a collapsible kit lens. So Nikon, give me a DX body and lens set that let’s me accomplish what I’m doing with some of my other cameras these days (e.g. the Olympus m4/3) and I’d buy and use them instead. If Nikon doesn’t produce those things, then I think you’ll find more and more leakage into the competitors and the value of that legacy lens pile will start to go down.